State Rep. Selene Colburn addresses the audience during the Opioid Town Hall Meeting. 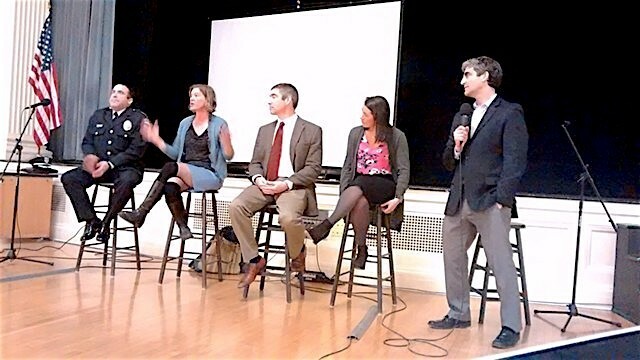 More than 130 people turned out to Burlington Mayor Miro Weinberger's Opioid Town Hall Meeting Thursday night to highlight local efforts to address the drug abuse crisis. By most measures, the prognosis wasn't good. Burlington should be ready for a "multi-year slog" to fight opiates, Weinberger told the crowd that filled Burlington City Hall Auditorium. Police Chief Brandon del Pozo, Rep. Selene Colburn (D/P-Burlington), University of Vermont Medical Center chief operating officer Stephen Leffler and Chittenden County State's Attorney Sarah George fielded questions from the audience and described their steps to address the problem. The city has redoubled its efforts over the last 18 months, Weinberger said. Its strategies included hiring opioid policy coordinator Jackie Corbally, increasing data collection to measure success and forming a CommunityStat group to collaborate on solutions. "Our office is spending more time on this than just about anything else," Weinberger said. So far, however, those efforts haven't improved outcomes, panelists said. "It's getting not just worse, but much worse," said del Pozo. "All the indicators we have are going in the wrong direction for several years." Colburn, who said she ran for office in part to address the opiate crisis, described a lack of priority status for it in Montpelier. She has supported bills to provide treatment for incarcerated addicts and to create safe injection sites. The panel fielded questions on children in state custody, patient privacy and punishment of dealers. One woman, who declined to share her name, described an accident in which she said a driver under the influence of opiates crashed into her car head-on, killing himself and paralyzing her passenger. Another audience member, Matthew Kaigle, described his experience recovering from addiction. "There are too many heartbreaking stories," Weinberger said. Weinberger solicited feedback on the city's opioid principles, which will direct Burlington's efforts going forward. 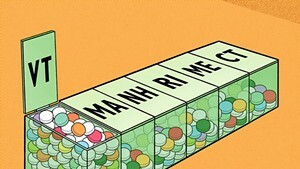 The principles, on posters hanging on the walls, label opiates as a public health crisis and affirm the role of government in addressing the issue. Weinberger and other panel members highlighted action that Burlington residents can take. They encouraged parents to discuss addiction with their children, patients to have conversations with their doctors and citizens to speak up in favor of relevant legislation. Colburn said she hopes to use her time off this summer to bring momentum to the fight. "I want to see a coalition of advocates come together on this issue to make noise and make change," she said.